It's a Sunday evening and what's the best way to spend the rest of the weekend than to relax with a face mask? I make it a ritual to always use a face mask at the weekend as I just think it's the best way to take time out and unwind. Lately, I have been enjoying the face masks that are from the Superdrug range. 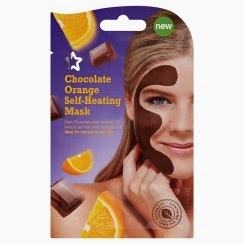 In particular, the Chocolate Orange Self-Heating Mask, what an experience! The first time I used this mask was just after Christmas, a couple of months ago when by pure chance I happened to be in Superdrug and was so intrigued by the concept that I picked some up. Until then, I had never tried a self heating mask so was slightly apprehensive and curious about what I was going to experience when I put it on my face. At home that evening I gave it a go, spreading the mask on my face, I soon realised that the mask was heating my face which was overwhelming at first but actually was very enjoyable! Leave the mask on for 15 minutes and then wash it off your face and you should have glowing skin.